Are you tired of serving spaghetti with red sauce and meatballs whenever you cook pasta? This bacon carbonara with eggs recipe is sure to be a big hit with your family. The dish has so many great flavors — the savory pasta and cheese, smoky bacon, and creamy sauce. You may want to double the recipe so everyone gets their fill! Our bacon carbonara recipe is the perfect choice for a weeknight dinner. If the kids have a big soccer game the next day or dad has an outstanding presentation at work, fill up their bellies the night before so they’re ready to go in the morning! Just remember — once you make this once, be ready to make it again! Your family won’t be able to get enough of this fantastic dish. 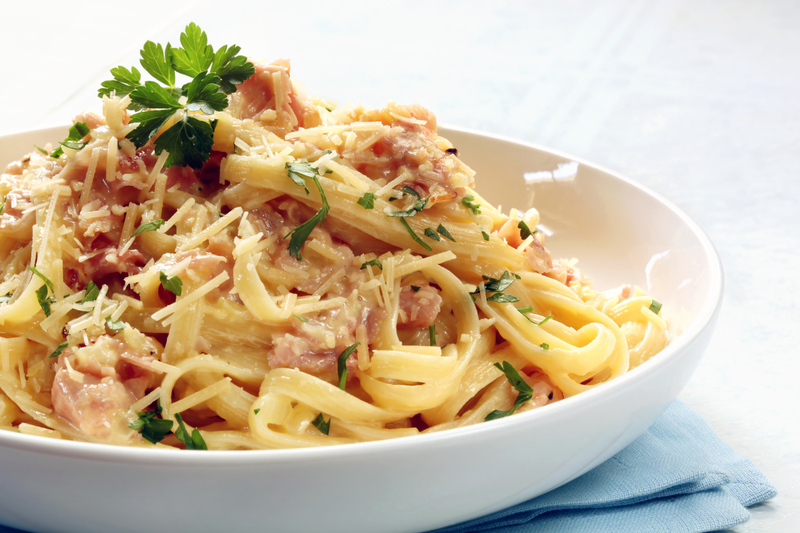 If you want to learn how to make bacon carbonara, check out our recipe below! In a large frying pan, warm up the olive oil over medium heat. Cook the bacon, frequently stirring, until it is crispy — about three to five minutes. Add the onion and garlic. Cook them until they are soft, about five minutes. Add the pepper and parsley and cook another minute. Meanwhile, cook the pasta according to the directions on the box. Cook the pasta al dente. When it’s done, remove 1 1/2 cups of the cooking liquid and set aside. Drain the remaining liquid. Add the pasta to the frying pan along with 1/2 cup of the cooking liquid and 1/2 cup grated parmesan. Cook the pasta mixture until it is well-combined. Make sure the pasta is evenly coated. Remove the frying pan from the heat and add the egg yolks. Toss the pasta mixture with the egg yolks until a smooth sauce evenly covers the pasta. Add more of the liquid if you need it. Add the grated lemon zest, lemon juice, salt, and remaining grated parmesan. Toss the pasta again to coat it evenly. If the sauce is too thick, add more of the cooking liquid to loosen it up a little. Divide the pasta among four bowls. Top each serving with more parmesan and lemon zest if desired. Are you looking for top-quality ingredients to make your cooking even better? Look no further than Sauder Eggs. Our eggs only come from trusted farmers who follow our high standards for quality. You never have to worry about your eggs when you choose us. Be sure to use our store locator to find the store nearest you.